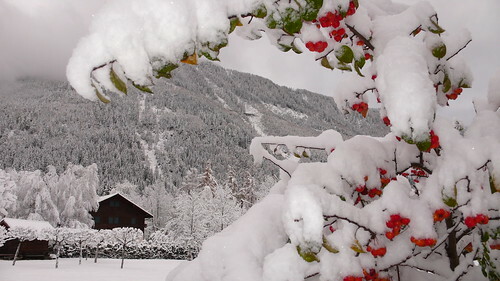 A tranquil spot just five minutes from the cosmopolitan centre of Chamonix, Les Praz de Chamonix is a beautiful Alpine village. Ringed with woods and mountains, it's home to the Flegere lift, giving access to some of the most spectacular walking in Europe. The Chamonix golf course, also in the village, provides a world class eighteen hole course with magnificent views. 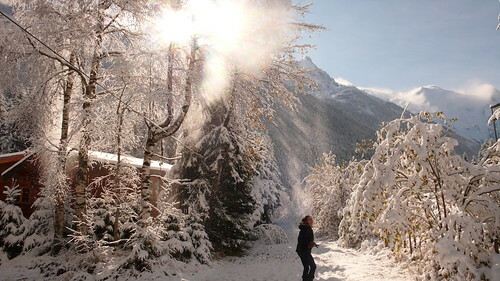 It's one of the sunniest parts of Chamonix, and is a deservedly popular place to stay or just enjoy. Take a look around with the photos, or find what you're looking for - there's information on transport, restaurants, things to do and more. If there's something you think should be added, please do get in touch! 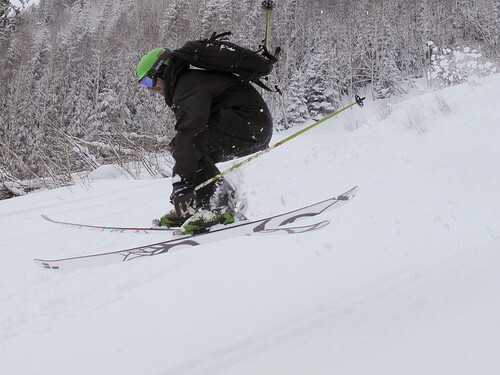 This photo was taken at the bottom of the home run to the Flegere base! 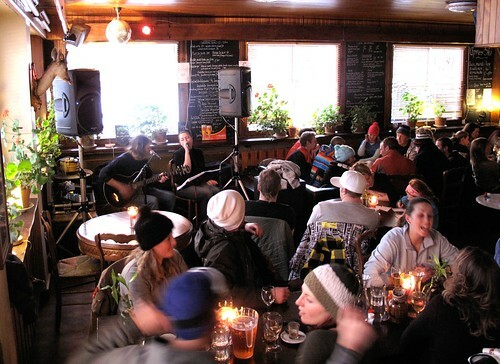 Another top apres at Les Rhododendrons! Scattering when the sun hits the trees…..
Good news! As we hoped, Flégère will be open over more weekends this Autumn. 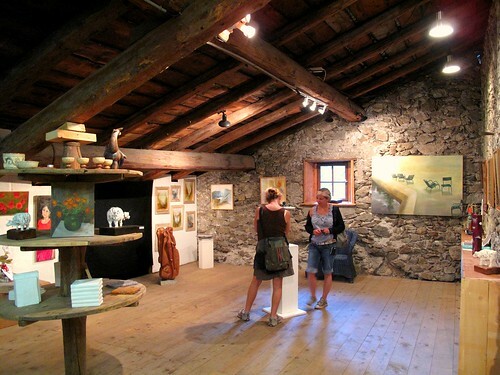 For the Toussaint holiday (25th October to 5th November) both Flégère and Index will be open. 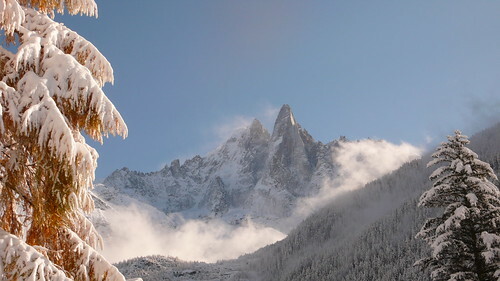 Meanwhile, Montenvers will close from October 13rd to 24th 2008, and the Aiguille du Midi will close from November 10th to December 12th 2008 – details and timetable here. Surely the prettiest setting of any cafe in on the Chamonix Valley floor, the Prairie has been run by the same family for four generations. 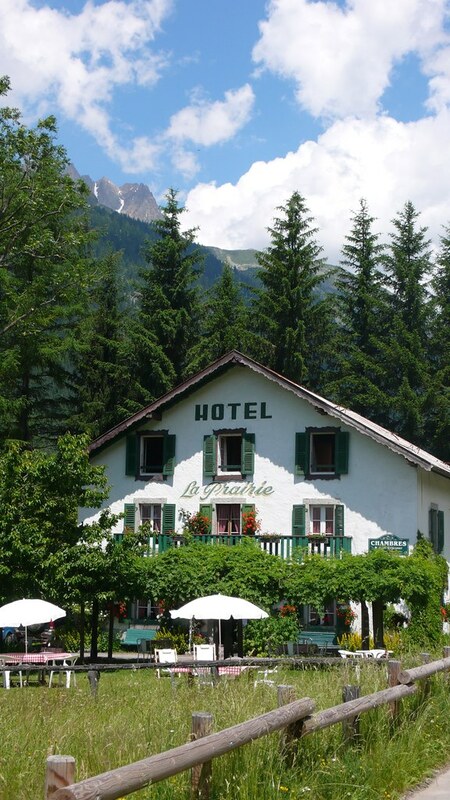 Set up by a 19th century mountain guide who climbed Mont Blanc 99 times from the front door of the hotel on foot (before the days of lifts), it still offers a warm welcome in simple, traditional rooms, home-made kir and other cordials, crepes, teas and light meals. A wonderful place to take a break from a walk, have a light lunch or an early evening drink, watching the light change on Mont Blanc as you sit under the pergola…. 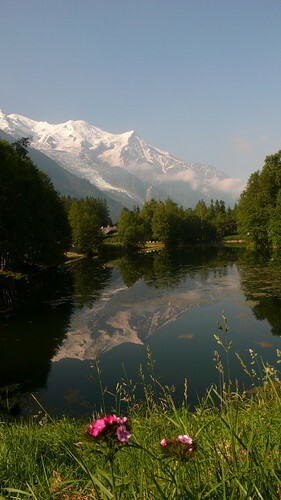 Near the centre of the village, you’ll find this tranquil lake – a beautiful place to admire the reflection of Mont Blanc. It’s surrounded by quiet back roads, which are good places for a relaxing stroll, and perfect with pushchairs. 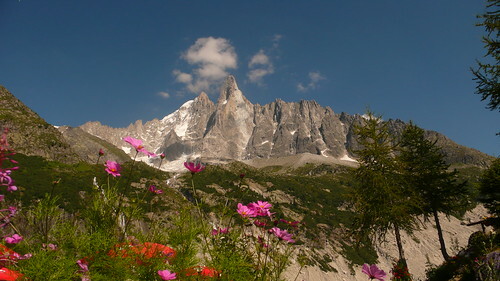 Les Drus and Aiguille Verte, originally uploaded by firechick. 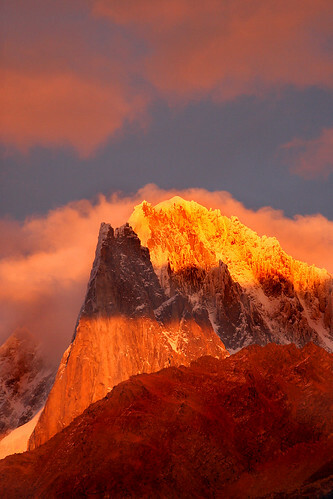 Another stunning photo from Genyphr, with fiery alpenglow on the Drus and the Verte. You can see their relative sizes more clearly from this angle, with the more snowy bulk of the Verte behind the geometric granite of the Drus. She has a wonderful series of photos here where you can see the progression of the colouring – it’s very quick when it happens, moving through a spectrum of reds, pinks and oranges before suddenly disappearing. 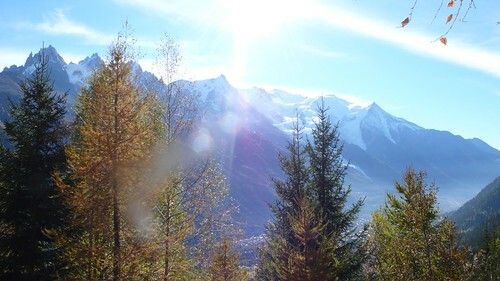 If looking at the soaring peaks surrounding Les Praz gives you a thirst to climb, there is no better place in the world than Chamonix. For those aspiring to routes like The Dru or the Aiguille Verte – “the Alpine summit that turns you from a climber into a true mountaineer”, Icicle Climbing can arrange flexible itineraries and guiding. For those who aren’t quite yet ready for those heights, they also offer climbing courses at all levels. In winter, there’s the exhilaration of ice climbing to try, too. Discover our part of France with this gite outline, a beautiful gite farmhouse with hot tub, sleeping ten and massive open space and peace.